Our friends, Bruce and David, along with their son, Erick, has been looking for the right dog for their family. They finally got a dog for their family - a Besenji. 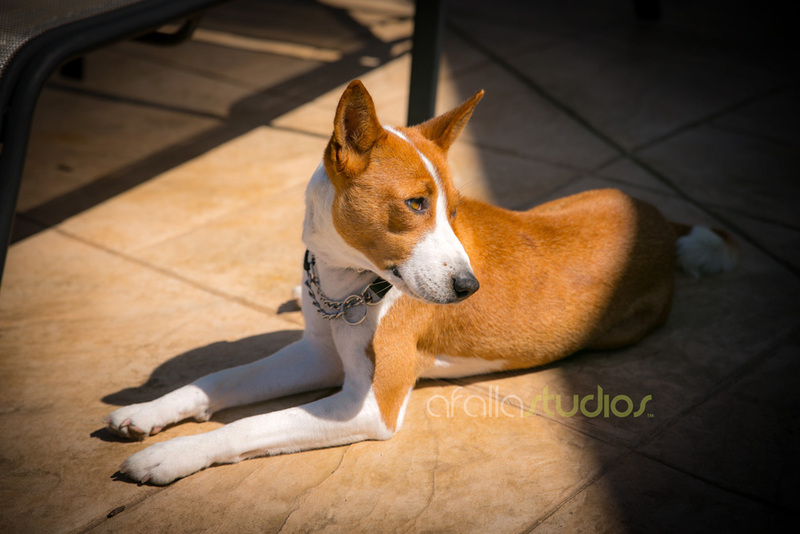 The Basenji is a breed of hunting dog that was bred from stock originating in central Africa. Most of the major kennel clubs in the English-speaking-speaking world place the breed in the Hound Group; more specifically, it may be classified as belonging to the sighthound type. The Basenji produces an unusual yodel-like sound commonly called a "barroo", due to its unusually shaped larynx. This trait also gives the Basenji the nickname "Barkless Dog". Unfortunately, he didn't have a ton of energy when we first saw him because he just got his booster shots that morning. These photos were taken in their back yard which provided enough sunlight to show off their dog's beautiful coat. Photographing pets in their home environment is always helpful because they're very relaxed in their habitat.